Test Method: -Kinematic viscosity is of primary importance in the design and selection of a wide range of petroleum products. Calibrated capillary viscometers are used to measure flow under gravity or vacuum at precisely controlled temperatures. Circulatory pump with control panel fitted on one side of the bath. Six (6) Holes for keeping viscometer holder made of heavy stainless steel. 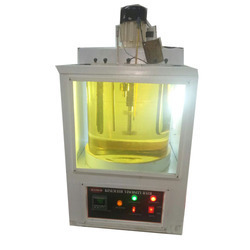 -Viscometer bath in 12 S.S, inner / outer M.S. 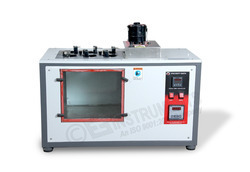 powder coated square body with front back toughen glass to view viscometer tube. -1/12 H.P. AC Motor (Pump) 1450 RPM for Stirring. We have marked a remarkable position in the market by offering the best quality array of Laboratory Water Baths Apparatus. 4 Viscometer with Digital Temp. Indicator & controller. Suitable for a wide range of applications such as oxidation stability testes an oils The bath is constructed double walled inside made of Stainless Steel outside of mild Steel painted in epoxy Powder Coating & insulated with 50mm Mineral Wool on five sides. IMC-731: Kinematic Viscometer Bath chamber size 12" X 9" X 12" deep to accomodate 4 Viscometers, temperature controlled by Contact thermometer & Electronic relay. IMC-731A: Same as above fitted with 2 outer glass panels on the exterior housing(Double glass).